The giant star, called Herschel 36, is bursting out of its natal cocoon of material, unleashing blistering radiation and torrential stellar winds (streams of subatomic particles) that push dust away in curtain-like sheets. This action resembles the Sun bursting through the clouds at the end of an afternoon thunderstorm, showering sheets of rainfall. Herschel 36's violent activity has blasted holes in the bubble-shaped cloud, allowing astronomers to study this action-packed stellar breeding ground. The hefty star is 32 times more massive and 40,000 times hotter than our Sun. It is nearly nine times our Sun's diameter. Herschel 36 is still very active because it is young by a star's standards, only 1 million years old. Based on its mass, it will live for another 5 million years. In comparison, our smaller Sun is 5 billion years old and will live another 5 billion years. This region epitomizes a typical, raucous stellar nursery full of birth and destruction. 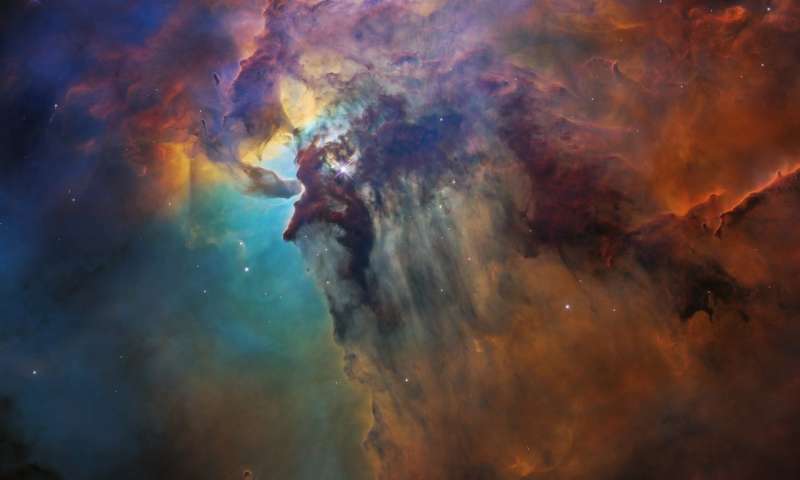 The clouds may look majestic and peaceful, but they are in a constant state of flux from the star's torrent of searing radiation and high-speed particles from stellar winds. As the monster star throws off its natal cocoon of material with its powerful energy, it is suppressing star formation around it. However, at the dark edges of this dynamic bubble-shaped ecosystem, stars are forming within dense clouds of gas and dust. Dark, elephant-like "trunks" of material represent dense pieces of the cocoon that are resistant to erosion by the searing ultraviolet light and serve as incubators for fledgling stars. They are analogous to desert buttes that resist weather erosion. The Hubble view shows off the bubble's 3D structure. Dust pushed away from the star reveals the glowing oxygen gas (in blue) behind the blown-out cavity. Herschel 36's brilliant light is illuminating the top of the cavity (in yellow). The reddish hue that dominates part of the region is glowing nitrogen. The dark purple areas represent a mixture of hydrogen, oxygen, and nitrogen. The observations were taken by Hubble's Wide Field Camera 3 between Feb. 12 and Feb. 18, 2018.